Get relief from back pain, regain your independence and take back your life with proven back pain treatments and cures. Doctors only treat the symptoms with addictive and dangerous prescriptions. Treatments and cures that start with your underlying body structure and the true cause of your pain are simply not an option for Doctors or Physical Therapists. 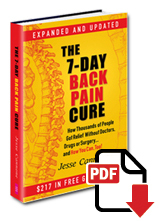 The “7 Day Back Pain Cure” book is the antidote to the surgery-obsessed approach to back pain. Based on over 2,000 hours, of research and supported by The Healthy Back Institute Medical Advisory Board, I've uncovered treatments & cures that go beyond prescriptions and devices, that are only revealed in this breakthrough book. You most likely will NEVER need back surgery if you truly follow these treatments and cures faithfully! Pain. It’s a powerful word that creates strong feelings. Think back to the last time you experienced pain. If you’re like most people, you probably remember some event that caused it—a paper cut, a sprained ankle, or a skinned knee. Most people believe that back pain operates the same way - that it’s caused by some isolated event. They “throw out” their backs, for instance, experience pain, and then have a back-pain problem. Since the pain happened rather suddenly, they imagine that if they can get rid of the pain, they’ll get rid of the problem. Like many things in life, the real story is more complicated. Back pain is just a symptom that can be caused by many different things. Two people can feel the exact same type of back pain for two entirely different reasons. If they were both to undergo the same treatment, one may start to feel better but the other may not. It all depends on why the pain exists in the first place. Let’s say you have a dog, and one night that dog comes in whining. You know he’s in pain, but you don’t know why. Pain is just a sign that something is wrong. Next, you may notice he’s limping, which is a good sign that the pain is probably in his leg somewhere, but you still don’t know what’s causing it. To find out, you need to do some investigating. Most likely, you would call your veterinarian and work toward finding a solution. You would not, in most cases, give the dog a pain reliever or a massage and then forget about it. Even if your dog felt better the next day, most likely you would still want to be sure his leg was all right. Unfortunately, you might not treat yourself with the same care. Many traditional back-pain treatments focus primarily - if not exclusively - on just getting rid of the pain. In the process, they fail to identify the underlying cause of that pain. Of course, it’s great to have pain erased or, at least, diminished. But easing the pain without solving the problem means one thing - the pain comes back. That’s why a lot of people seem to frequently “throw out” their backs and experience persistent, recurring back pain. Pain Is a Message... So Listen! Pain is your body’s way of telling you that something is out of balance, or “messed up” in some way. That may not be the technical term doctors use, but it’s the most accurate one I can think of! Through pain, your body is trying to send a message that something is wrong and it needs help. When the message is silenced but the underlying problem is ignored, the communication has failed. Consequently, your body starts to “yell” louder by giving you more pain - recurring and more severe pain. Your body is trying to tell you something, but you aren’t listening! What I want to emphasize here is that we can’t just focus on symptoms like pain. Instead, we must turn our efforts toward figuring out and fixing the underlying problem causing the pain. Before I explain the primary causes, however, let me start by dispelling a few popular myths. Usually, some physical activity precedes the back pain, like picking up a heavy object, sneezing, bending over, or getting out of bed. The thinking goes, “Well, since I didn’t have pain before the activity, the activity must have caused the pain.” As you’ll see in the next few chapters, the reality is a bit more complicated. In many cases, a physical activity can trigger a pain episode, but by itself, it isn’t the underlying cause. It’s very similar with back pain. A physical activity can trigger a pain episode, but it’s not the “fuel” behind it. If you don’t get rid of the underlying problem, then any number of things can “trigger” the pain. While this is sometimes, if not often, the case, it’s not the only underlying cause of back pain. Other factors that originate in your mind (e.g., stress levels) as well as your diet (unhealthy foods) can cause severe back-pain episodes, even when there’s nothing wrong with your spine, discs, joints, muscles, or ligaments. These factors also can exacerbate physically caused back pain, making it many times more painful. If you experienced a back-pain episode two months ago and another today, you’re likely to think these episodes are unrelated. Perhaps the last time it happened because you sneezed. This time you were moving furniture. For most people, the trigger that causes their pain episode is different on different occasions. Naturally, they associate the “cause” to the trigger and believe the episodes are unrelated. In fact, in the vast majority of cases, multiple back-pain episodes are usually caused by the same underlying problem— even if each pain episode had a different trigger. Let’s consider again the room filled with natural gas—a dangerous situation, no doubt. But the gas is the source of the danger, not the match, static cling, or a cell-phone ring that might create a spark to trigger the explosion. The same is true when it comes to back pain. Once you’ve created conditions in your body, inadvertently or otherwise, that are ripe for an explosive bout of back pain, any number of things can set off a pain episode. Different activities that may trigger pain are only sparks igniting the gas that was there all along. Which Are You Suffering From? Though there are many back-pain conditions, such as sciatica, scoliosis, and a herniated disc, we can narrow them down to two basic categories: nerve-based pain and tissue based pain. You may have one or the other, or you may have both. Some treatments will ease nerve pain, others improve tissue pain. Some might, in some cases, work for both. But determining the right treatment for your particular case can require some investigation. This is, incidentally, why so many back-pain sufferers find inconsistent relief. Let me explain the differences between the two types of pain. As the name suggests, nerve-based back pain is caused by a nerve that’s not happy for some reason. Typically, it’s being pressured, pinched, compressed, or injured in some way— usually by a nearby muscle or bone. For example, if a nerve is surrounded by or next to a muscle that’s unusually tight and inflexible, that muscle presses on the nerve, causing it to hurt. This is common in sciatica. If a nearby piece of bone, such as a vertebra in your spinal column, is out of position, it also might press on the nerve, causing pain. These bones themselves may be out of position due to an overly tight or inflexible muscle nearby. In other words, the whole process may start with a tight muscle but end with a nerve that’s irritated by a bone. Tissue-based pain, on the other hand, originates in the muscles, tendons, ligaments, or other connective tissues in the body. (Most commonly, the pain originates in the muscles.) Think back to the last time you gave someone a neck or back massage. You may recall feeling one or more “knots” in the muscles. These knots are one of the main causes of tissue based pain. One way to tell if a knot is really a knot, or just a bone, is to see if it exists on both sides of the body in the exact same position. If it appears on both sides, it might be a bone or part of a joint. If it only appears on one side, it’s more likely a knot. A trigger point is caused in part by a pooling of toxins in your muscle tissue—which, in turn, is usually caused by imbalances in your diet, excess negative stress, and/or damage to the actual muscle fibers as a result of an injury and/or excessive exercise or physical activity. If you’re under a lot of stress, for example, your body’s natural tendency is to shift to more shallow breathing and to “freeze” parts of your upper body (clenched jaws and tense shoulders are a few examples). This “freezing” reduces the amount of oxygen in your body and slows the circulation of blood in certain areas—such as your back. Without the optimal level of oxygen from deep breathing and without natural body movement to keep the blood flowing, toxins get “stuck” within tight muscle tissue. If this is allowed to continue for a long enough period of time, a trigger point develops, causing pain. Trigger points also might be caused by an imbalance in the diet. For instance, many people who have been led to believe they aren’t getting enough calcium may, in fact, be deficient in magnesium. Without magnesium, the body can’t process calcium as it should. Magnesium also is involved in the muscle-relaxation response, so if the body doesn’t have enough of it, trigger points are more likely to develop. Since proper muscle function depends on both of calcium and magnesium—and since they depend on each other for absorption into the body’s cells—an adequate, balanced supply (along with potassium and other trace minerals) is necessary for healthy, pain-free muscles. Studies have shown that supplementing with these nutrients can help ease trigger points. Another way to really aggravate trigger points is to drink too little water. When you’re dehydrated, your blood doesn’t have enough fluid to flush out all the toxins and other biological waste that your body produces. Under normal conditions, the blood washes away all these waste products, moving them to the liver and kidneys, where they are eliminated from the body. But if you’re even slightly dehydrated, there isn’t enough water in your blood to do a good cleaning job in the little spaces between the cells that make up your muscles. When this happens, you’re much more likely to develop trigger points—or if you already have them, they increase in size, severity, and pain. Other types of tissue-based pain, such as pulled or strained tendons or ligaments, also can be caused by overuse. While a sudden trauma or injury can pull a ligament—a very extreme form of overuse—doing the same type of moderate-intensity activity too many times can strain a tendon or ligament, too. There is a fine line between using and overusing your tendons and ligaments. Notice how similar types of sharp, shooting pain—a trigger point in the muscle, an inflamed tendon, or a compressed nerve—can be caused by entirely different reasons. As you’ll see in the next chapter, this is quite common. You also will see that if you don’t know what’s causing your pain, you could very easily choose the wrong treatment approach! You may already have an idea which type of pain you have. If not, you’ll figure it out as you go through this book. For now, just remember that you need to know what’s causing the pain before you can reasonably expect to get rid of it. As I mentioned earlier, most people think they “throw out” their backs and then experience back pain. While you now know that this isn’t the case. All back pain comes from one of three sources and these are almost always overlooked by doctors and other health care professionals. That’s exactly what I’d be thinking. And it's also why we're also giving you our FREE Pain Relief Quick-Start Guide. You shouldn't have to wait for pain relief... and with this simple guide, you won't. In just minutes, you can be on your way to reliving the back pain that’s plagued you. And it's easier than you might think. We've packed the most effective stretches and gentle moves our Medical Advisory Board knows into just two easy-to-follow pages. Plus, I've added some quick tips and resources to help you get started down the road to relief the quick-and-easy way. Just print out your bonus Pain Relief Quick-Start Guide. In five minutes (or less! ), you can be on your way to a pain-free life. You'll discover countless pain-busting secrets in The 7-Day Back Pain Cure. But with your bonus Pain Relief Quick-Start Guide, you'll be on your way to a pain-free life before you even get to page one! And it's yours FREE when you order The 7-Day Back Pain Cure today! My 6 easy-to-implement lifestyles changes you can make TODAY... and watch your back pain begin to disappear just a few days later! What treatment(s) is right for your specific pain condition! How to easily and quickly eliminate your pain caused from sitting all day! This quick-n-easy fix takes just seconds per day and for many people can relieve back pain nearly instantly! The NEW alternative to back pain surgery which is less invasive... safer... has fewer side effects... and provides permanent relief! I’ve ordered a small batch of 2,000 copies of this book. They are packaged up and ready to be shipped immediately. Because the last time I sold this through several bookstores, it sold 18,500 copies in a few short weeks. So it’s simply a matter of supply and demand. You see, this book was previously sold at bookstores. But in order to reach more people, I recently printed a very small batch of 2,000 copies, on my own, through a local printer, costing me $4.93 each. So to get this book to you, it's costing me $9,860.00 to print all 2,000 of them. If I paid shipping on top of that, it would be another $11,900.00 (and thats just for U.S. shipping) I quite frankly can't afford $21,760.00 right now. Sure, I could just make this book available as a PDF download. But you see, the reason why I'm willing to spend as much as I can afford $9,860.00 to get this book in your hands is that I find that those people who are willing to pay shipping and read my book, usually buy one or more of my other products and then I have a customer for life. So all I ask is that you pay a small shipping fee, and I'm still losing money on this deal, especially, if you don't buy anything else from me later. Like I said, the book is free. All I ask is you cover the postage of $5.95 inside the USA. I’m using USPS and their flat rate for a book this size is $5.95 shipped anywhere in the United States. If you’re out of the country, shipping will be $9.95. As soon as you request it, we ship it to you. (Unless it's in the middle of the night, and then we’ll do it in the morning.) We'll also email you with your shipping information. You can expect to get it in about 7-10 days. "This Book is Truly A God Send"
"I wish that I had found this book earlier. It has helped me more than the pain management doctor. I really did not want to manage the pain - I wanted rid of it and wanted to get back to my normal activities. The exercises have helped greatly. I am pleased with my progress and continue to exercise, watch what I eat and take NO pain medicines. "I first had back pains in 2000. It was clear what the trigger point was. Yet I self-limited to physiotherapy which only reduces the pain but does not resolve the root cause of the problem. For 11 years I have been coming and going. Now thanks to Jesse I know what to do. I have a clear path to success. I said path, not pathology because muscle balanced therapy is ahead of me to live the life of my dreams"
I thought I had read everything on back pain. Not so. This book has so much information on every thing to do with back problems, including what to do immediately for pain. Most important to my mind are the clues on finding the causes and what to do about them. Anyone with any kind of pain in the back would do themselves a huge favor by reading this book." "I was thrilled to read a book that actually gave honest and useable info. I had been to two doctors/ specialists and had a battery of tests run only to be told there was no answer to my recent back issues and that it may be stress. I knew there was more to it. Within a week of reading the book I am pain and incident free. I will use the info and special stretches and exercises for years to come." After injuring myself overtraining for a marathon as a seventeen year old I ended up severely damaging nearly every ligament from my hips down. The doctors said to not run again for at least two years. However, the injuries never properly healed and I suffered constant but manageable pain. A few years later I started having back pain and five years ago I had an x-ray of my back done and what it revealed was a back twisted like a pretzel. By this time I was eating eight Mersyndol each night just to get two-hours sleep. I started receiving treatment with a chiropractor, which made a big difference. Most days I would feel only low-level pain and experience severe pain a couple days before my regular fortnightly appointment, but I couldn't sit for long periods. On plane trips between Perth and Melbourne I would spend most of the flight standing in the aisle. Since starting to use Heal-n-Soothe, Rub on Relief, Lose the Back System, 7-Day Back Pain Cure Book and the Freedom Back the pain stopped. Within a couple days it reduced significantly, and a couple of weeks later it was just gone. A month later I flew to Guangzhou from Perth and sat in an economy class seat for eight hours comfortably. Even on the flight back with an injured shoulder I slept soundly. These days my chiropractor is astounded by the change, and the careless ease with which I move around. I no longer have to be careful to avoid pain. It has now been six weeks since my last chiropractic appointment and I still feel great. My Mid-Back Pain Stopped After The First Week!!! I've been having mid-back and/or lower back pain for several years now. I came upon Jesse's book a couple of years ago, and purchased the inversion table which helped me immensely. A few months ago I started having pretty bad mid-back pain and about two weeks ago I purchased Jesse's program. I did the assessment and I started to work on the muscle imbalance and stretching. My mid-back pain stopped after the first week!!! I am working on this program daily so my muscle "forget" the bad habits, they become stronger and more elastic. I'm combining this with inversion table and I'm pretty sure that in thenext few months I'll regain the strength, elasticity, balance my body needs. Thank You! 365 Days Personal 1-On-1 Phone Support - Included with the 7 Day Back Pain Cure Book - If you have any questions about anything covered in the book - or if you'd like to talk about a specific pain condition or treatment we're here to help in any way possible. Just pick up the phone and call 1-800-216-4908 or email us for personal support for anything related to your pain or condition. No Other Book On Back Pain Comes With This Level Of Support. I personally 100% Guarantee that this book will help you greatly reduce, or completely eliminate your pain or I’ll even return your $5.95 postage fee! That’s right. There’s ZERO risk... either or your pain goes away or... Just call 1-800-216-4908 and I’ll give you back your $5.95 with no questions asked. Been Given Away Absolutely FREE! I’m mailing you a 254 page book that is the exact system that over 355,594 other people have used to rid themselves of back pain, regain their independence and take back their life. The book is free, and all you pay is the shipping of $5.95. I'm also giving you $59.85 in additional Bonus Audio Programs! These are instantly downloadable MP3 audio programs that reveals how a formerly illegal treatment reverses pain in minutes, 4 things that cause sciatica, and finally, how to HEAL a herniated disc. Plus I’m also including a full 365 days of Personal 1-On-1 Phone Support, included with your 7 Day Back Pain Cure Book order today. If you have any questions about anything covered in the book - or if you'd just like to talk about a specific pain condition or treatment, we're here to help in any way possible. This is a very limited offer because I’ve only ordered 2,000 copies of the book and they are packed and ready to be shipped. The last time I tried this, it sold 18,500 copies in a few short weeks - so this will probably sell out quickly. In fact, if you don’t like the book let me know and I’ll even give you back the $5.95 you spent in shipping. Click here and claim your copy now. You won't regret it. Plus, get Free emails on how to live pain free. Don't Want The Printed Book?